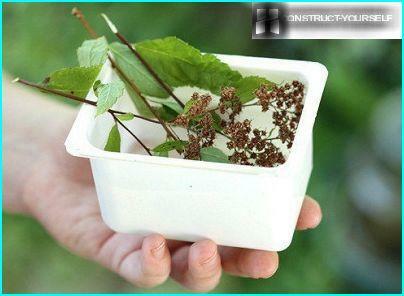 This kind of plants can grow as thesmall (15 cm), and strapping (2.5 m). The branches of shrubs erect or creeping. The color ranges from light to dark brown. The roots shallow, filamentous. During flowering spirea is covered with numerous small flowers in the inflorescences of different forms. Colouring the petals - from snow-white to crimson. Spiraea inflorescences may be located either around the run, and on the upper part or at the end of the branches. Propagated plant seeds, cuttings, dividing the bush, layering. Spirea does not need pruning. 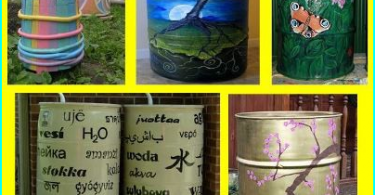 It is carried out exclusively for decorative purposes, to give the bushes more aesthetic appearance. Crohn's plant can be thick and dense or a bit "sparse", but it always looks attractive. Branches in bloom to the ground, so no unsightly effect "bare feet". All plants of the genus spirea can be divided into twogroups: spring-and letnetsvetuschie. First Flowering profusely, but short-lived. Bushes second group does not bloom simultaneously for two months. The flowers have a more saturated colors. Low-growing varieties are often used for decoration of the Alpine hills. spirea gray. The plant gets its name not because of the colorpetals (they are white, like all spring, the species), but because of the gray-green color of leaves. This is the most common type of spirea. Flowering period - from May to mid-June. The inflorescences are located throughout the length of the shoot. Special attention gardeners enjoy spirea gray "Grefsheym". The plant reaches 1.5-2 m, has a spreading crown and boil-and-white flowers with a diameter of 1 cm, collected in inflorescence-umbrellas. spirea Vangutta. This hybrid Cantonese and three-blade spiraeaup to 2 m The flowers are small -. 0.6 cm, collected in hemispherical inflorescences. Dark green above and a dull blue-gray below the autumn leaves turn reddish. This variety can bloom twice - at the beginning of June and in August. spirea Argut. Bushes plants reach 1.5-2 m, have a beautiful shape. 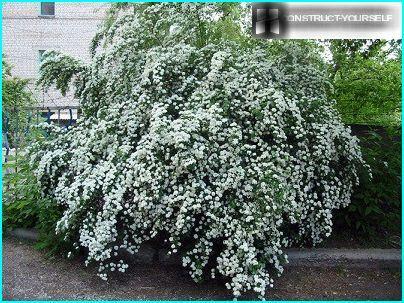 During flowering (late May to mid-June) spirea Argut like a fragrant white waterfall. They inflorescences appear at the ends of youngshoots. At the same time last year the branches die. Letnetsvetuschie views presented varieties of spirea Japanese, purple loosestrife, Blumalda and others. The flowers may have a pink or red color. "Shirobana". Features varieties - small leaves (2 cm) and white or pink flowers. Blooms in July-August. "Goldfleym". bush leaves change color depending on the season - copper from yellow to orange. Flowering red and pink small flowers. "Crispus". It blooms from July to the end of the summer. The flowers are small, pale pink, gathered in a flat umbrella. "Little Princess." The short (0.6 m), a slow-growing variety. The flowers are large - up to 4 cm in diameter, reddish-pink, gathered in corymbose inflorescences. The plant blooms in the middle of summer - in June and July. "Golden Princess". This is one of the varieties of "Little Princess." The variety has a greater height bush - up to 1 m, yellow leaves. spirea Bumalda. This kind of hybrid. Plants reach a height of 0.5-0.8 m, has erect shoots and very beautiful leaves - green in summer and autumn yellow, red with a purple hue. The flowers are pink. Among the most common spiraea Bumaldagrade - "Goldfleym". 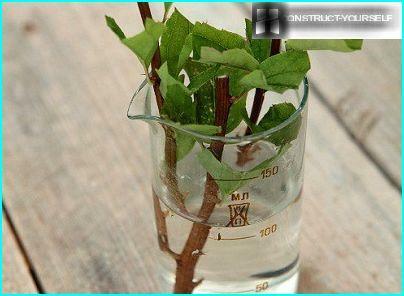 The shrub reaches a height of 0.8 m If the plant is planted in the sun, its leaves change color depending on the season -. From gentle golden-orange to coppery red. Leaves bushes planted in the shade, do not undergo such changes. spirea ivolistny. The variety has long spiky leaves (up to 10cm), and white or pink flowers. The inflorescence can reach lengths of 20 cm. spirea Douglas. Flowering period - July to September. Flowers - dark pink. Bushes grow to 1.5 meters in height. spirea Billard. 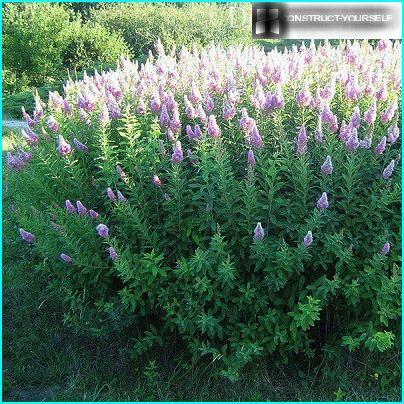 This hybrid spirea purple loosestrife and Douglas. Bushes high -. 2 m pink flowers, collected in the long inflorescences. Blooms from mid summer until frost. Even before the final selection of planting locationsbush should determine the desired size and plant species. Varieties differ in size: they may be compact and fit on a small area, and can grow upwards and outwards. Therefore soliternoy landing clearance hedges and alpine choose different kinds of plants. For hedges should be selected varieties,which give little basal shoots and respond well to pruning. Alpine slide can be decorated with slow-growing varieties. And for single planting is best to choose plants with well-developed basal shoots, which occupy a large area. For rockeries and rocky gardens used dwarf varieties. Select multiple varieties, flowering at different times, a gardener can achieve flowering spirea from spring to autumn frosts. Shrub reproduces both generative(Seeds) and vegetative (cuttings, layering, dividing the bush). The first method is time-consuming. It is used mainly breeders when working on breeding new varieties. During the multiplication of seeds planting material harvested in the fall, are sown in special trays with the ground and germinated under the perforated film. Planting sprouts in the open ground can be carried out in the spring. The soil should be well fertilized. Vegetative reproduction can be of three types. For him, choosing shoots 10-15 cm in length withoutFlowers treated with fungicide solution, after which they are ready for planting in the ground. It is best to plant Spiro indoors. The soil is moistened, the water is sprayed to the humidity was about 85%, and covered with a film cutting. The film is pre-prepared - pierce holes for air intake. Place it in the 30-40 cm from the planted stalk. The easiest and most effective method. Percentage survival rate of seedlings obtained by cuttings, is very high. 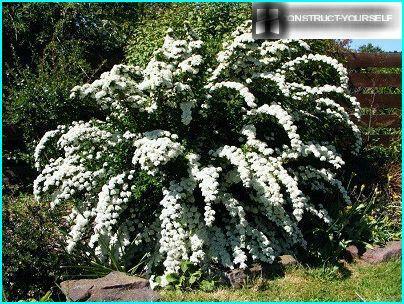 Spirea branches bend down, is attached to the ground and covered with soil. Pretty soon branches take root, after which they can be cut from the bush and transplanted seedling already ready. This manipulation is usually carried out in autumn orspring. If you want to divide the bush in the spring, you should choose the period before the first buds. Spring breeding spirea has both substantial advantages and disadvantages. Advantage - in the rapid inclusion of plants in growth, the lack of - an increased risk of infection of the root system because of the warm weather. To solve this problem, the seedlings are soaked in a fungicidal solution. Spiro should be planted in slightly acid, but betterin the pH-neutral soils. The soil should be rich in nutrients, with normal aeration. 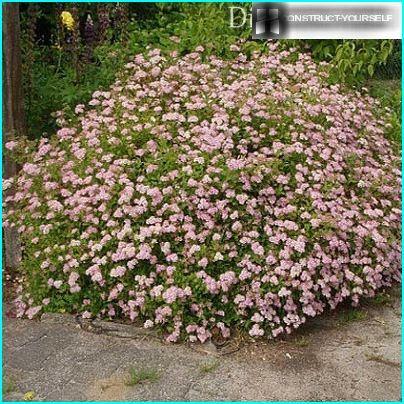 In the spring, Spiraea is better to plant in autumn, but letnetsvetuschie well acclimatized and in spring and autumn. Many gardeners are of the opinion that the best month for planting letnetsvetuschih grades - September. Excellent neighbors to spirea can be conifers - spruce, juniper, arborvitae. Planting material necessarily treated with fungicide. 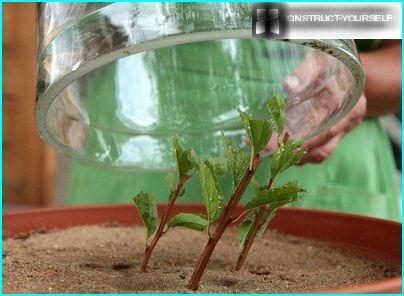 The damaged part of the cuttings should be removed. It is best planted in a sheet or turf soil. If poor soil, fertilize it, adding peat or a mixture of leaf soil and sand. It is necessary to arrange a drainage layer thickness of 15-20 cm. For this fit the broken brick, leaf soil, peat and sand. Plant stalks should be at a depth of about 0.5 m.
The root collar should be flush with the ground or recessed 1-2 cm. Perfect weather for planting - overcast, rainy. After transplanting the plants into the ground it is poured, sprinkled with peat or sawdust. 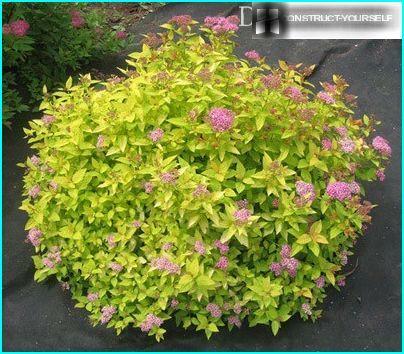 Pit for spirea should be a third morethe root system of the plant. Her dig for 2-4 days and allowed to stand. Then equip drainage plant is lowered into the pit, throw the earth and compacted. If Spiro propagated by dividing the bush, the plant is extracted from the ground, put into the water for the soil compartment, and then cut with shears into pieces, each of which must have a good root lobe and a pair of escapes. To bush attractive look, itcut and form a crown. Very beautiful bushes spherical and pyramidal shape. The specific "cut" the owner chooses, focusing on the overall style of the site design. Pruning does not affect the development of the plant. Delete should be weak and old (7-14 years) branch. They cut to the stump. Haircut crown is best done in the spring until the leaves have appeared. If the cut in the middle of summer, it can be re-blooming spirea to fall. After trimming the soil watered with manure, dilutedin water. The mixture should be poured at the roots. Fertilize and possible solution of superphosphate. Proportions: 8.10 g fertilizer to 10 liters of water. Also suitable and "Kemira Universal". On 1 sq.m. 100 g of granulated making means. Spirea not need intensive watering, enough to maintain the plant during periods of drought. 1-2 buckets of water would be enough for a normal bush life. In winter, you can hide the roots of 10-15-cm layer of leaves. Spirea susceptible to fungal diseases -askohitozu, ramulyariozu, septariose. Define they can be by the appearance of spots. The plant is recommended to spray Bordeaux mixture, "fundazol" or colloidal sulfur. 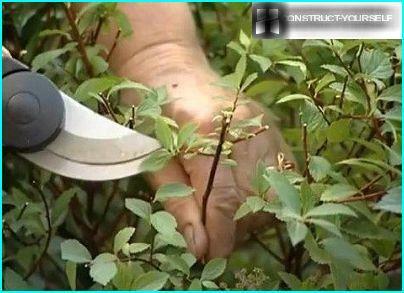 The main thing is to handle the bushes before or after flowering. From the pests can be most unpleasantspider mites and aphids. Signs of the "work" of the tick - the appearance of holes in the leaves, their wilting and abscission, web. To cope with the threat, you can use spray or phosphamide karbofosom. The presence of aphids can be identified by bitten off and faded inflorescences. In order to combat aphids use pirimor or similar means. Spiro can attack snails. How to cope with them, you can learn from the video, which describes the particular crop and plant care.